Fishing for carp in may is the best time. Not a lost cause, as some “experts” are convinced that our hero of the story caught exclusively in the summer. In may, when the waters begin to rapidly warm up, and rushes to the shores to be fed every fish, including carp. And most importantly — at this time, the good biting big carp on a variety of bait and the nozzle. Any specifics carp fishing in may, in contrast to other months almost none. But there are some nuances of how to catch carp may. This month carp behaves somewhat more wary than other times, so anglers are not particularly trying to be quiet in fishing, a fishing rod equipped with a thinner line. The average number of bites carp in may not less than in summer, but more often burn the large ones. Most chances of running into a good bite and catch a big carp — from 7 to 10 am. We should notice that the carp is very unpredictable in behavior and lure selection. The bite may carp sometimes happens unexpectedly for the angler. For example, it happens: Karasik several times sluggishly pulls the nozzle on the hook, several times put a float on the water, and then suddenly drowns him. However, most often grape upon pulling baits, the carp swallows it and conducts a float aside. In the case of a long game carp with the bait on the hook, anglers need to choose the right time for hooking — too early, cutting the risk that the carp will be scared and walk away, if you late back heel along with the big fish swallowed the bait go into the reeds or under the snag where it has to raise will be hard. Experienced anglers are advised: avoid sharp undercuts, because the lip of the carp weak, broke and trophy carp will go away. At great depths the carp loves, prefers to dwell not more than a two-meter layer of water. Comes and the shallow water centimeters in twenty-five. Water in may is still transparent, not muddy in the summer, so we need to consider the fact that the carp broke can see the fisherman and scare him, to step aside. Therefore, angler, fishing in the shallows, uses a long rod — at least five meters, or rods rigs spinning reel for distance casting. Carp — fish is unpretentious to environmental conditions. The fish are caught in almost all freshwater bodies of Russia — the rivers, lakes, ponds, sometimes even in the swamps. Winter carp almost never caught, at least in ponds and small lakes — the cold season waits to bury his snout in the mud. Carp — fish settled, does not like to go far from one of the chosen places, so in the spring, summer, and fall meet in the same places. As already mentioned, carp are not like big depth. It is extremely rare at depths greater than two meters. Far away from the coastline rarely gets. If the water is heated up to 12-15 degrees, it can be found in most rocks. The fish prefers to stay around the vegetation, it is often found in “Windows” among the reeds, but reeds are not themselves sets. Throwing bait in the bait window, the fishermen manage to catch many large carp. Tip! River carp are looking for in places where the current is least strong — oxbow lakes, backwaters, reedbeds and other vegetation. Despite the fact that the river and lake carp outwardly from each other to distinguish, if only we are not talking about different subspecies of fish, experienced anglers claim river carp catch more he resists the more intense. 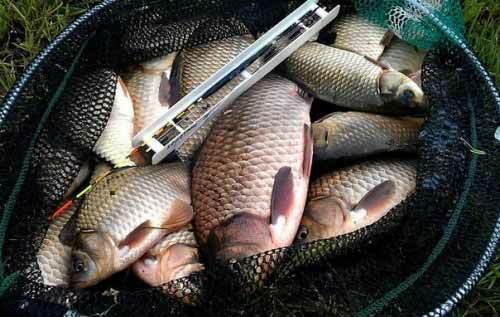 Anglers engaged in fishing for carp for years know that he is in the food even the fussy. Even within one fishing the hero of our story often changes preferences: pecking, pecking at the worm and suddenly flatly refuses to him — now give him now, for example, maggots. Knowing the quirks of gourmet carp experienced anglers take fishing several baits and nozzles. It is believed that in the beginning of the spring fishing carp prefer high-calorie baits of animal origin, and as the heating of water he is more interested in plant tips. Interesting detail on the moth in may carp caught sluggish, it is rare at this time they are tempted, but not always. Most of the carp in may, caught on the float rod. Carp this month caught at some distance from the shore, so the rod fishermen choose long — from 4 to 6 meters. The rod should be as light as possible, in order to be able to throw the lure into the water quietly, because the carp in the pre-spawning period, shy, the excess noise will scare from the fed. 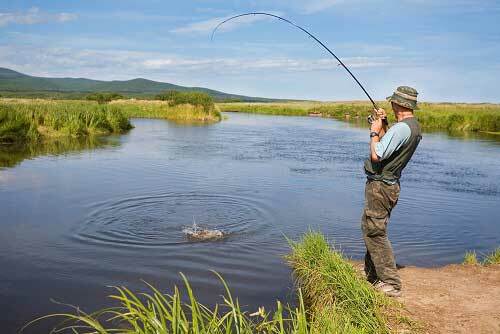 If the rod is equipped with a spool for long casting lure, it is permissible to use rods of shorter length. plug — rod consists of several parts, which are connected to each other by means of connecting pipes, having certain skills, it is not easy. May the timid fish, so a fishing rod equipped with a thin fishing line, from 0.12 mm to 0.18 mm. On the flight and the plug rod put light floats weighing up to grams. Proved successful floats of a type of goose feathers, they are very sensitive to the slightest bite. Match rods equipped with floats weighs approximately 12-15 grams of Bologna fishing rods enough float weighing 3 to 5 grams. Okrujayut floats lead gruselle in the form of pellets. Their weight depends on the buoyancy of float: float-gusinku need a small pellet on the float, weighing 15 grams sinker must be heavier. Completes the process of equipping a fishing rod the hook is the use of high-quality and very sharp products of famous companies under No. 10-14 according to the international classification or the same number 3-5 on domestic numbering. In recent years, widespread fishing for carp on feeder tackle. Catching a carp in this way and may. So what is feeder tackle? A: feeder — nothing like a modern donkey. 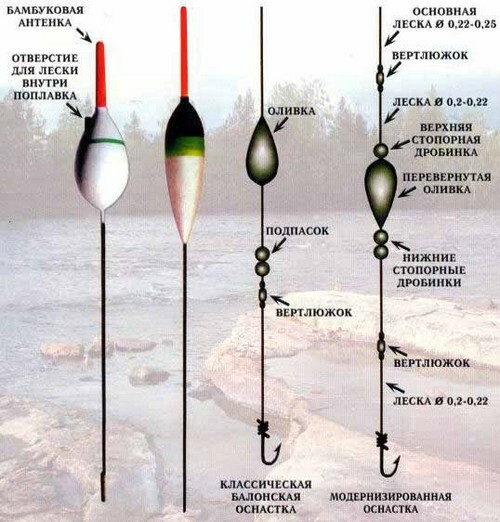 Feeder tackle consists of a rod that looks very similar to the spinning blank, spinning reel and basic fishing line wound on it, by the end of this fishing line with swivel and clasp fastens the leash to which using the same vertluzhnoj and carabenciov attached the feeder and the hook for inserting the bait. The feeder also serves as a sinker, its bottom filled with lead weight. Feeder rod and spinning varies according to the type of system and test. slow operation — under load bent all the rod. As a rule, the form feeder is equipped with interchangeable tips of different sensitivity — quivertips. A large part of the feeder forms are longer and heavier than spinning rods, because after casting they don’t need to hold in your hands, because is placed on of the slingshot support. However, there is a feeder short and small rods. Even fly fishermen use for spring fishing carp. Lovers spring carp fishing feeder mounted on the rod spinning reels, capable of holding 100 yards of fishing line with a diameter of 0.18 millimeter. The coil should have a friction brake and, preferably, the bait runner for free and clear fishing line. Anglers with experience recommend: buy quality coil from manufacturers, and it will not fail you in important hours, when the bite is large and strong fish. Experienced fishermen prefer as the main line to put monofilament with a diameter of not more than 0.18 mm, and for leash choose a fishing line that is much smaller diameter — to 0.15. If the coil is wound the braid, then its diameter is taken to be even smaller: the main line — up to 0.15 mm, and the leash to 0.12. The leash attached hook No. 3 to No. 5 at the domestic classification. It is desirable that the cross section of the wire of the hook was large enough, as the thin hook is able to penetrate the weak lip of the carp.